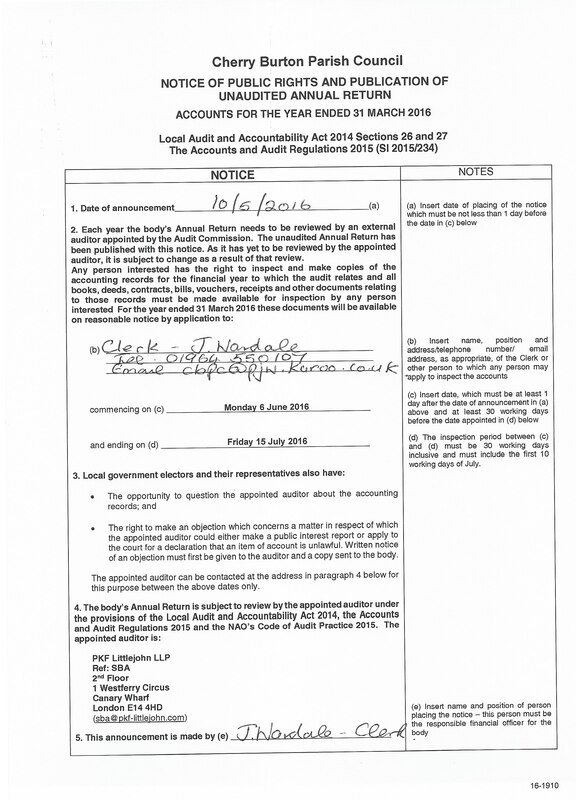 The Parish Council has in the 2019-20 Council Tax precept had to make financial provision relating to an unusual potential liability. This has, regrettably, resulted in a significant increase in the Council Tax precept. The Parish Council is unable to comment further at this time. More details will be provided as soon as circumstances allow. Please find linked below a Notice & Alternative Routing Map from Highways Maintenance showing a temporary up-coming road closure for Main Street, Cherry Burton. This is to enable reinstatement works to take place. The road will be open for resident’s access, the Emergency Services and Pedestrians only. The road closure order commences from Wednesday 19th September but is likely to complete on the same day. 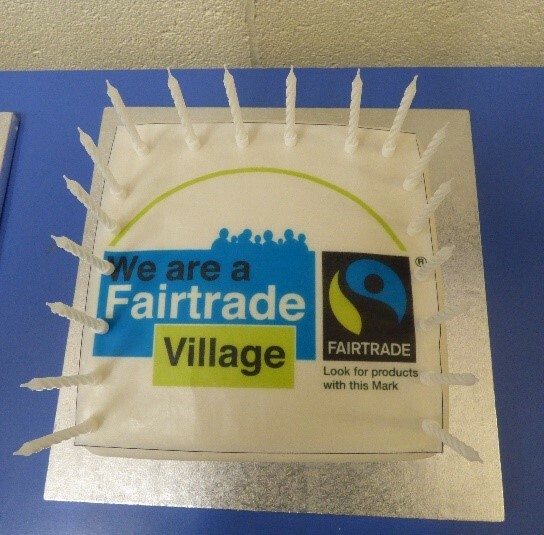 See here for news on the latest village streetscene visit by the ERYC Parish and Area group. The loose stones on the surface of the TROD are due to it not having been rolled yet. East Riding of Yorkshire Council can only do this once there has been a period of rain and, given the exceptional hot weather recently, this has not been possible. Now that there has been rain ERYC are planning to finish the work and this should result in the surface bonding together. Road closure to enable Emergency felling of tree on Malton Road. After 14 years, we finally have a safe footpath out of our village! The Parish Council have two allotment sites in the village and there is currently no waiting list for plots. Rent this year is £15 per plot which includes water. If you are interested in renting one, please contact the Clerk to the Parish Council – see below. The footpath (or 'trod') along Etton Road is now under construction and due for completion by 8th June. 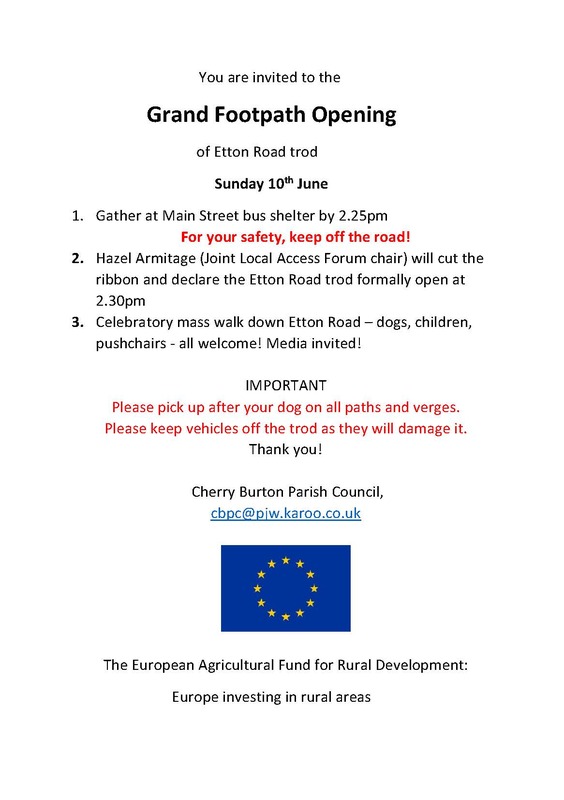 This is thanks to funding from the European Union LEADER programme and Cherry Burton Parish Council, and will provide safe walking access from the village to the Hudson Way and beyond. An official launch is being planned for Sunday 10th June at 2.30pm. Please put the date in your diaries and join the celebrations! 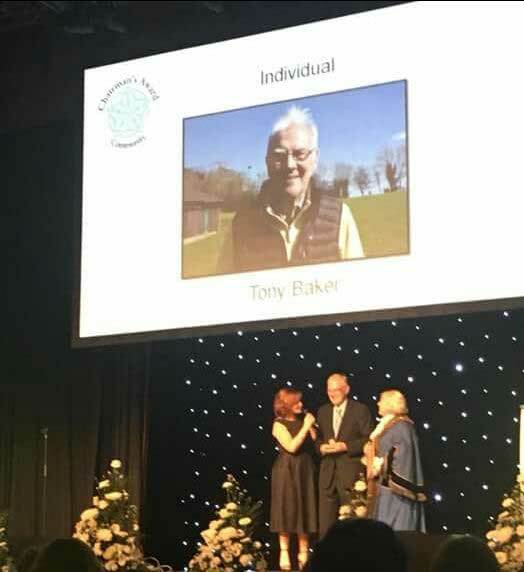 Tony Baker has done an enormous amount of voluntary work for the benefit of Cherry Burton residents. He is a member of the Sports Field Management Committee and has accessed grants to plan and build the multi-purpose games area (MUGA). Tony is on the tennis club committee and spends hours checking the courts, the multi-use games area and the outside gym and carries out any maintenance needed. He has also obtained funding to renovate the toilets which now include four new toilets and hand-washing facilities. Tony is concerned about the environment and ensures the trees, hedges, paths, and parking areas are well maintained. He put up bird and owl boxes around the cricket pitch and the allotments and has planted meadow flowers. 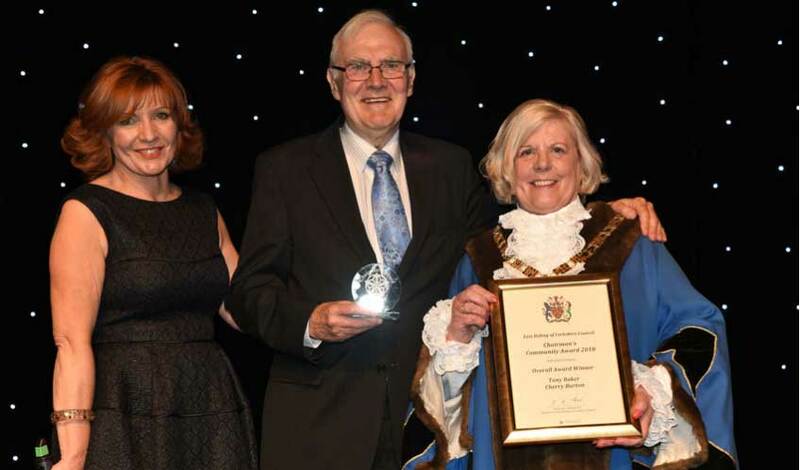 He has been instrumental in fundraising for refurbishment of the tennis courts by arranging race nights, quiz nights, tombolas and stalls at the village show. Tony said: “I never expected to win this at all – I’ve never won anything in my life before! “I feel elated, proud, privileged and honoured to have won. I didn’t know that I had been nominated until I had a letter so say I was being considered. The Parish Council application for Rural Development Funding for England (RDFE) 2014-2020 LEADER grant funding has been successful and is for a grant to create a 600m trod (compacted hard-core path) to provide a safe off-road path linking the village with its Public Right of Way, the Hudson Way on the east verge of Etton Road. The chosen supplier is ERYC Highways Construction who will start work in early May (after the Tour of Yorkshire) and complete by the end of May. LEADER funding is jointly provided through the European Agricultural Fund for Rural Development ("EAFRD") and by the Department of Environment Food and Rural Affairs ("DEFRA"). In order to increase the likely hood of getting barn owls nesting at the Sportsfield we are advised that having two nest boxes in the near vicinity of each other improves the likely hood that one of them will get used. We will keep you updated if we are successful in attracting a nesting pair of barn owls. The Beverley Community Museum in the Beverley Guildhall is running a programme of temporary exhibitions on various social history topics for Beverley and the surrounding area. The latest exhibition, which is called "Beverley's Satellite Villages" includes information on Cherry Burton. The Beverley Guildhall is located in Register Square, Beverley, adjacent to the main post office. They are open from 10am to 4pm every Friday, 10am to 1pm every Wednesday until 30 April and 10am to 4pm every Wednesday from 2 May, always with free admission. There is an additional opportunity to visit on Saturday 7 April when they are open for the New Paths Music Festival. The exhibition runs from 21 March to 13 July. The Cherry Burton Sportsfield Committee are delighted to be involved with National Bird Box week. 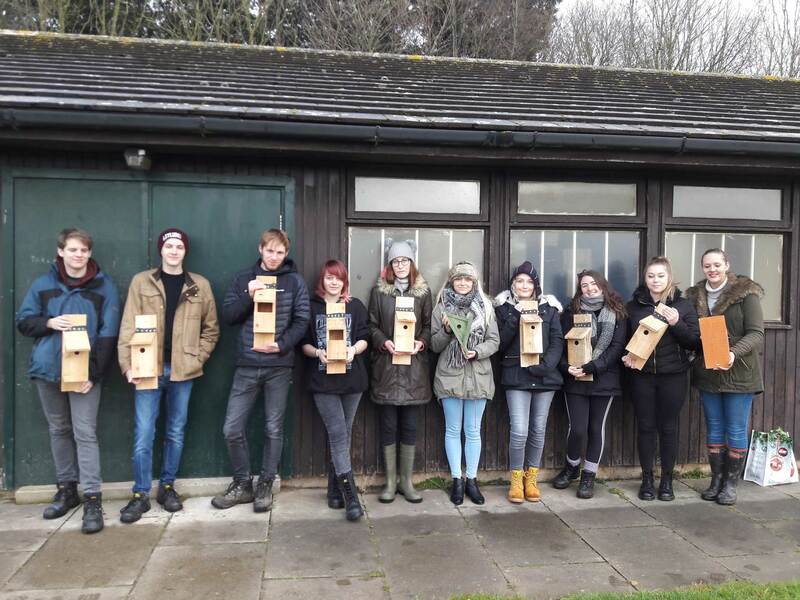 Bishop Burton College surveyed the site and, in conjunction with HMP Humber who supplied 24 small bird boxes plus a barn owl box, a team of students arrived on site and erected the nest boxes in the most appropriate positions. Different designs of boxes have been erected to attract different species of small birds. The College will regularly re-visit the site to record the occupancy and species of the birds using the boxes. We will report their findings later in the year. We are now benefiting from the bluebells and snowdrops planted in the woodland in 2017 .This year we have ordered additional English bluebells and cowslips, these will be planted in the spring to flower in 2019. If your TV reception is being affected by the new mobile mast, please telephone this number 0808 13 13 800. They will either send a free filter or arrange an engineer to call and sort the problem out. please pass on the 0808 13 13 800 telephone number to any of your neighbours who may be affected by poor TV reception. The All-Party Parliamentary Group for Animal Welfare has revealed an increase in dog attacks on livestock which is costing farmers millions of pounds and causing great distress. In a ground breaking report released today, November 16 2017, the Group has released new data on dog attacks on livestock which shows the growing problem of incidences of livestock worrying by dogs. 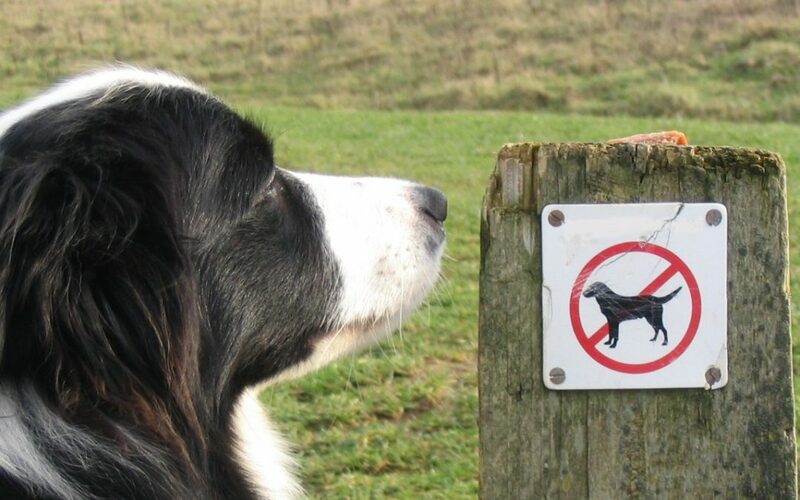 The report has recommended that more is done to ensure dog owners recognise the risk their dog may pose to other animals so they can take measures to prevent incidents such as ensuring dogs cannot escape from the home, using the lead where needed, looking out for signs warning of grazing livestock and attending training classes. • DEFRA should regulate the industry of animal behaviour and training to ensure that pet owners can find reputable professionals to help them. After a period of consultation, East Riding Library Service has launched a new streamlined Mobile Library Service from October 2017. The new service is significantly different from the previous offer and the sites visited may have changed in frequency, duration or day of the week for the library visits. See Here for full information and dates for the library bus route. 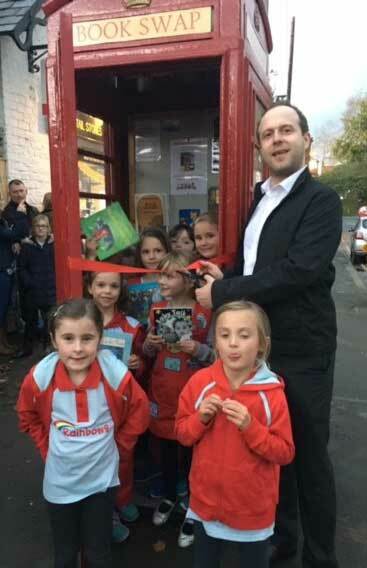 On Tuesday 24th October the Parish Council Chairman James Slingsby, Cherry Burton Rainbows with Sue Smith and Friends of the Telephone Box all came together to cut the ribbon and open the Book Swap to the Public. 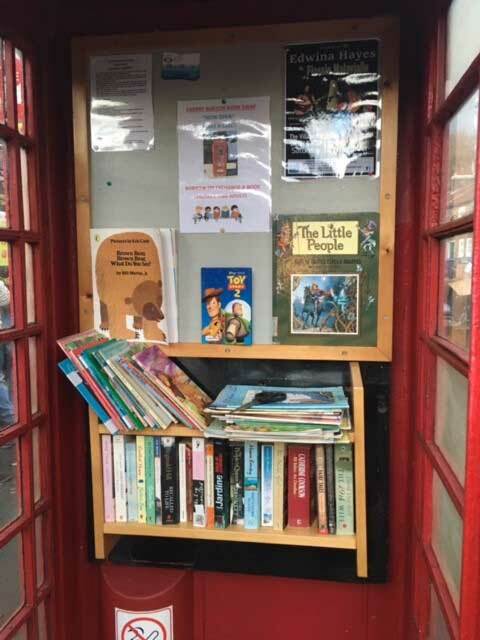 Situated outside the shop the decommissioned telephone box has for some time been lovingly cleaned, painted and fitted with book shelves by a dedicated group of volunteers led by Mike Ralphs and Jim Smith to make it an inviting place to swap books. It is open to all the public. See Link or for printing here. Please note that Acklams will be operating an additional journey on this service from Tuesday 5th Sept. 2017 which leaves the Sow Hill Bus Station at 1710 serving Cherry Burton and Etton. A highway improvement scheme is planned to commence on the A1079 Killingwoldgraves roundabout on 11th September 2017 and is expected to be completed by the end of 2017. The scheme involves widening the A1079 leg from Hull along with the A1174 and A1035 legs to provide longer two lane approaches and entries to the junction, also providing two lanes for circulation on the roundabout itself. The scheme aims to reduce the queues and congestion currently forming on the approaches to the roundabout, improving journey times and journey time reliability along the A1079 and other road corridors passing through the junction. See Letter from ERYC dated 3rd Aug 2017 for further details and restrictions. Are you in need of additional security measures in your home such as: Additional locks for doors and windows, Door Chains, Door Viewers, Window Alarms or Security Lights? • A homeowner or private sector tenant / Housing Association tenant. Everyone living in the property must not have a bank balance, when added together, of over £5,000. Cherry Burton Parish Council has been successful in securing agreement from ERYC to erect a 4G telecom mast for the village. A Planning Application has been submitted and approved and our partners Shared Access will be erecting the 22 ½ m mast during September. The mast location will be behind the tree copse w. of the football pitches. Network operators will be Vodafone and Telefonica. 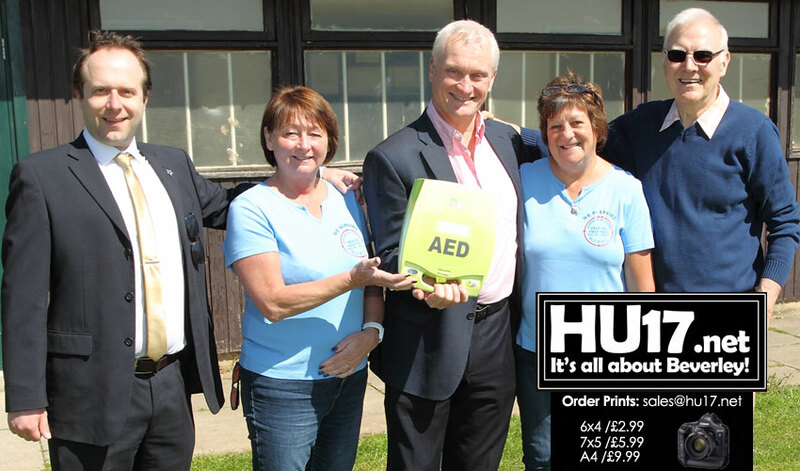 A local Charity and MP Graham Stuart have been out to see the latest defibrillators to be installed in the area thanks to their joint efforts. N.U.R.S.E. who helps fund the project joined the MP as they visited locations in Beverley, Cherry Burton and Lund who have all recently installed defibrillators. Vera Robinson from N.U.R.S.E. said; “Graham has been campaigning for local council parishes to have automated defibrillators installed due to emergency service cuts and delays. Due to this campaign the N.U.R.S.E. Charity received requests for help. In total, N.U.R .S. E. has now provided seven automated defibrillators to the more remote villages in our region. Cherry Burton Sports Field received their defibrillator in March." James Slingsby, Chairman of Cherry Burton Parish Council said they had no problems in getting support from local people. A second defibrillator for the Sportsfield has been kindly donated by the N.U.R.S.E. charity based in Beverley who raise funds by organising quiz nights, fun runs and sponsored walks. In addition all the sports clubs and the Baden Powell groups have supported this financially which has included giving a donation to N.U.R.S.E. in appreciation. The defibrillator is situated on the west wall of the pavilion. In May 2016 the Parish Council hosted a visit by the ERYC Street Scene Team to identify minor problems around the village such as potholes, overgrowth, damaged curbs, etc. Prioritised repairs will be agreed and carried out within budget limits: Village Taskforce Schedule within remit of ERYC taskforce team. Additional schedule of Issues passed to other resolving groups are: Schedule Pages. 1-10, Schedule Pages 11-18. 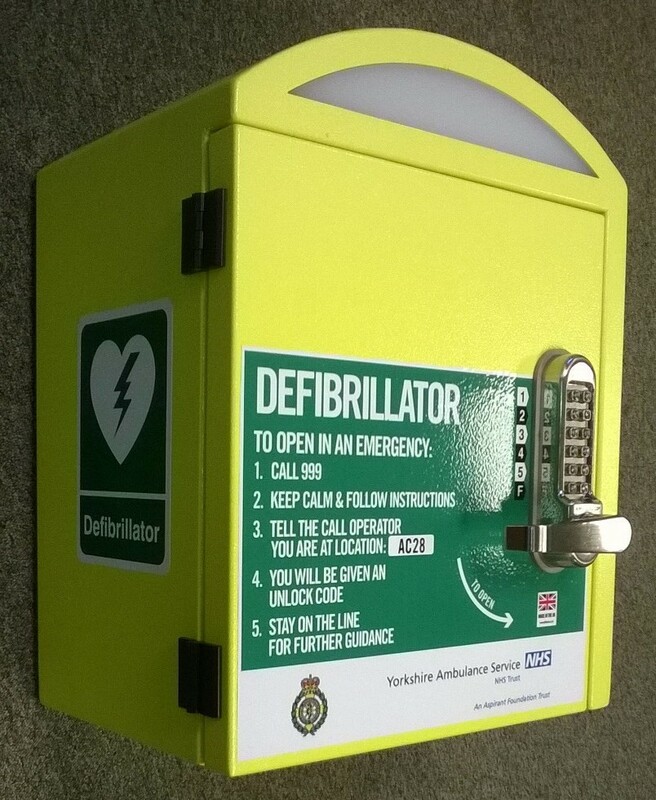 Our defibrillator is now in service and sited on the back wall of The Bay Horse Pub. Please remember to dial "999" first in order to gain access.